Tiles are a perfect addition to our homes because they play a huge part in enhancing the overall look of our property. But poorly set-up tiles can have the opposite effect and leave you either regretting your decision or spending more time, energy and money on the renovation. On the other hand, with the tile leveling system, you do not need to end up in this miserable state. These systems can aid you to seamlessly level your tiles so you can have a splendid looking tile work inside your house. With that thought in mind, we reviewed six of the best tile leveling system on the market today. We included the pros and cons of each product as well as our verdict based on research. In the latter part of this post, we shared some important tips on how to choose the best tile leveling system for you. The moment I read the features of this product, I was immediately hooked. This leveling system includes a kit which features 300 clips and 100 wedges. Thus, you can guarantee to give the most value for your money! I am also impressed at how the clips can serve as spacers because of the uniquely-designed, built-in, 1/8-inch spacer that cuts the necessity for spacers. The clips are very easy to break after use, adding convenience to your work. As soon as you acquire the tile leveling system, it is guaranteed to last longer, considering it’s made in the EU with top-quality precision and materials. 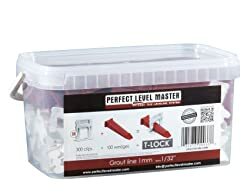 The clips and wedges are very durable and you can expect to have a solid tile leveling installation work with this system. 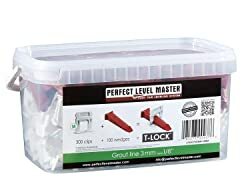 If like me, you aim to get your desired results, save time, and relax every time you are setting up tiles, then the tile leveling system by Perfect Level Master can be a great choice for you. Your tile installation does not need to cost too much. We highly recommend the Spin Doctor Tile Leveling Pro Kit. What I love about this product is that the kit includes 200, 20-mm, re-usable, pre-assembled spindles, which are intended to feature a screw element that includes a bigger grip and head element. Also, the system includes 100 clear view shields so you can have a great time looking at your work. As a result, you can be certain to make very few mistakes – if any – and save in long-term costs. Get the Spin Doctor Tile Leveling Pro Kit when you require a system that is fast and easy to set up because the spindles don’t need additional tools during its installation. Moreover, the system is an ideal choice if you want to have a spotless gout line because the system doesn’t include spacers, which are quite breakable. The Spin Doctor Tile Leveling Pro Kit is a convenient system because it is easy to set up. It also removes easily and cleanly, with the most minimal force and eliminates the problem of tile fragmentation or leaving unwanted obstructions. Align and perfectly set your tiles automatically for expert results with tile leveling clips from Z-Color. The product includes 200 clips for every bag, making for an accurate tile setting and perfect leveling of tiles. What I like about this system is that it is very easy to learn whether you’re at the novice, intermediate or experienced level. What results from your work would be a perfectly leveled tile installation after the application of adhesive cures or thinset. And best of all, the clips are made of quality and durable plastic, which makes them immovable during installation. This Z-Color 400pcs Plastic Tile Leveling System is useful for large format installation, heavy tiles and wood plank with rectified edges. The starter kit manufactured by Raimondi is really made for starters. This kit takes in 100 normal clips, 100 wedges, and floor pliers. You can be certain that this tile leveling system is user-friendly considering that the installing and elimination of the spacers are meant to be fast and very easy. 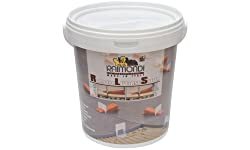 What I like best about the Raimondi Tile Leveling System is that it contains everything needed to eliminate tile lippage fast. You’d get good joint clips and a hundred reusable floor pliers and wedges inside a storage bucket. 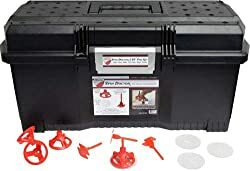 This tile leveling system is an excellent option when you require a leveling system that’s perfect for use once you buy it. Fifth on our list is the Peygran leveling system, which is the leveling system that will produce a lippage-free stone and tile set up. Aside from that, it is also a durable and strong leveling system because it’s manufactured in Spain with the use of top-quality materials. 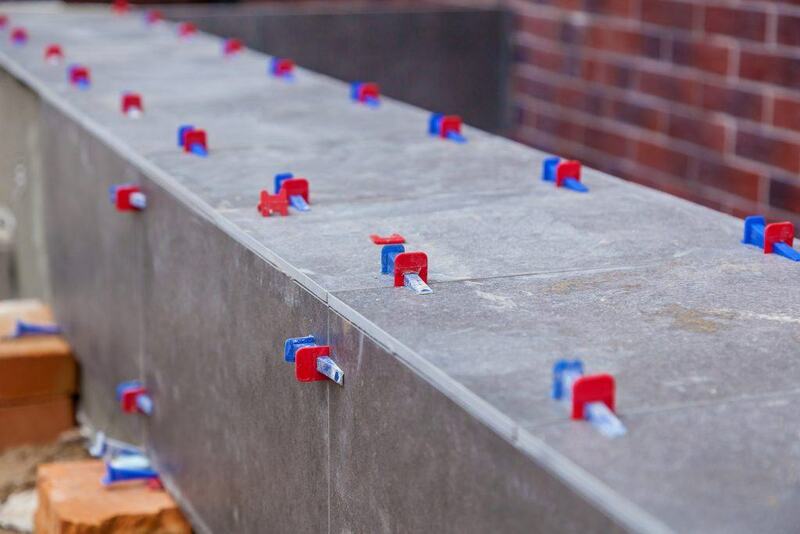 You can utilize this leveling system to guarantee evenness between the tiles because it has clips and wedges. Once bought, you will see that the kit includes 100 wedges, 100 clips, a durable bucket, and an adjustable plier. The clips have a multi-purpose utility because of its spacers that take into account 1/32-inch, 1/16-inch, and 1/8-inch grout lines. Thus you don’t have to get those spacers in another package or kit. 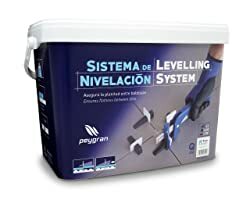 The Peygran Tile Leveling System is a high-quality product. The wedge system and leveling clip ensure flatness while avoiding any unnecessary movements in the mortar setting. What I love about the PERFECT LEVEL MASTER’s Tile Leveling System Complete Kit is that it is user-friendly. You can acquire this leveling system especially you need one that is simple to use. The leveling system is also very quick to set up and easy to remove. As soon as you obtain this system, you don’t need to get those spacers from another package or kit because Perfect Level Master’s already integrates 300 clips with a 1/32-inch spacer design. Aside from the system’s clips, the leveling kit also has 100 wedges, allowing you to acquire the best value. The product is manufactured in EU with the best quality materials used to guarantee you that you’re getting a top-quality design and product. Thus this system is a perfect choice for starters or DIY-ers out there. You can eliminate wall and floor tile lippage with Perfect Level Master’s tile leveling system. Now that you have our top six choices for the best leveling systems, you can always explore more if you want to shop around. But we should remind you again that shopping around may take more of your time with very little results if you don’t know what you’re looking for. So here are a few tips to help you compare different products and make a choice. Generally, the best tip would always be that you remain honest with yourself and your needs – especially when it comes to your budget. It may become less a matter of whether it works on small or large projects and more to do with how much it costs. For instance, all six products in our review are excellent. But how much are you willing to pay for one? You can always settle for a cheap tiling system. But why do we sometimes go for a more costly design? The answer is simple. We want to make our lives easier by making sure that the product does good work and lasts longer. High-end models, just like the six bests ones we reviewed in this post, for instance, can hold the tiles better because they have better clips. So put the budget in mind for the product which you think will satisfy your tile working needs and try to find a compromise with the product’s quality and efficiency. If there’s one thing that sets a system apart from other systems, it is the fact that you can easily detach clips that are under the tile. High-end systems, like the ones we reviewed in this post, contain clips that break off with just a simple touch of the mallet; besides which, they won’t break at all. That’s the kind of functionality we’re looking for – especially with the QEP 99720Q. Other systems may have clips that make it difficult for you to line the tiles up and set them in place. While these products are, no doubt, quality products that work wonders, they may take more of your time compared to other brands that are easier to set up. One of the major points for choosing the best tile leveling system is to your tiles even and level while saving money. It is for that reason why models like the ATR Resolution may not be the best in this aspect, even though they have cool features like the innovative corner-clip design – it takes a longer time to get the item ready for use. If you’re working on a project under a strict deadline, then you might not find such a tile leveling system the best for you. It is also important for you to know how much planning is required for each system with the kind of project you want to get done. You will require this not only so you’ll have a template to use, but also to get the exact number of clips required for the job. All the products listed in this review post are great tools to help you save time in getting your DIY job done right. But you’d probably only choose one among the five because one is all you’ll ever really need. So which among the five products is the best? Well, the final decision will depend upon you because your needs may vary. But we like the Perfect Level Master’s T-Lock system not only because of its excellent quality but also because it is the easiest to use although we do think it can be expensive for you. While the Spin Doctor Tile Leveling Pro Kit is not far behind in terms of quality, it is, as we’ve mentioned, taking too much time to prepare and setup and the spindles are a bit thin. The Z-Color 400pcs Plastic Tile Leveling System, however, provides not only quality and competence but also affordability. The QEP’s 99720Q is also affordable but doesn’t equal in quality compared to the brands we’ve mentioned. We hope this review post and guide was helpful to you. Which among the five systems is your top choice? Feel free to share your thoughts in the comments. We hope you’d find the one system that will best meet your needs.